Crayfish (yabby) body fossils and burrows discovered at Dinosaur Cove in the Otway Ranges, Victoria, have provided the first physical evidence that crayfish existed on the Australian continent as far back as the time of the dinosaurs (Mesozoic Era), according to a recent international study. Anthony Martin, senior lecturer in environmental studies at Emory University in Atlanta, headed up the study that included team members Professor Chris Austin (Charles Darwin University’s Head of School - Environmental and Life Sciences), and CDU PhD student Mr Mark Schultz. The team also included Australian scientists Thomas Rich and Gary Poore, of the Museum of Victoria, and Lesley Kool and Patricia Vickers-Rich, of Monash University. The fossil crayfish study was recently published online in the earth science journal, Gondwana Research. Thomas Huxley, a well-known colleague of Charles Darwin, was the first scientist to ponder how crayfish, which cannot survive in saltwater, could have spread to so many continents. “Biologists have long been fascinated by freshwater crayfish due to their wide distribution and ability to adapt to extremely diverse environments,” Professor Austin said. Australia’s crayfish fauna is of global significance due to the large number of species, for a dry continent and their ecological and morphological diversity. Dr Martin said: “Studying the fossil burrows provided an insight into the ecology of southern Australia about 115 million years ago when the continent was still attached to Antarctica (Gondwanaland). During that era, diverse plants grew in what is today Antarctica and dinosaurs roamed in prolonged polar darkness along southern Australian river plains. The period is of particular interest to scientists since it is believed to be the last time the earth experienced pronounced global warming. 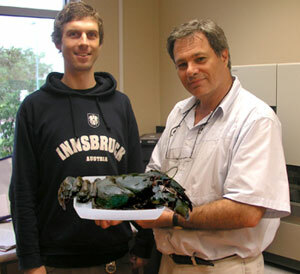 "The evolution of Southern Hemisphere crayfish has challenged researchers since the 1870s," Dr Martin said. "Only now, 140 years later, are we starting to put together the physical evidence for this evolution through the discovery of fossils." Professor Austin said he was delighted to be involved in traditional research that the University’s namesake would have appreciated. The research dove-tailed with the findings of his and Mr Schultz’s ongoing research on the evolution of Australia’s yabby fauna using DNA sequencing. “Fossils provide the hard evidence for evolution that is so often needed to put into context modern comparative data now commonly produced from molecular genetic laboratories,” Professor Austin said.